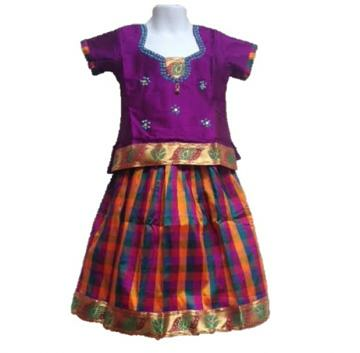 Colorful girls Indian cultural dress – Pavaadai/Blouse. Gorgeous design making it ideal for any special occasion or festival. Ideal for dance or recitals as well. Great durability and construction with inside lining that is rare in this type of dress. Unique dress only available one per size, so it will be sold out in a particular size quickly! This item in Pattu Pavada for Kids category was first added to our catalog on 03-16-2016. Buy Pattu pavadai for 7 to 8 yr Girls, sold & shipped by SS Fashions where you can shop online for Traditional Ethnic Indian Dresses - 50% off Clearance sale . This Pattu Pavadai collection has been tagged as latest design,traditional dress, kids Indian Pattu pavadai, art silk pavadai sattai,barathanatyam, kids wear, dance dress.